This is a guide to build a low-cost system that will collect data from any number of wireless sensors. 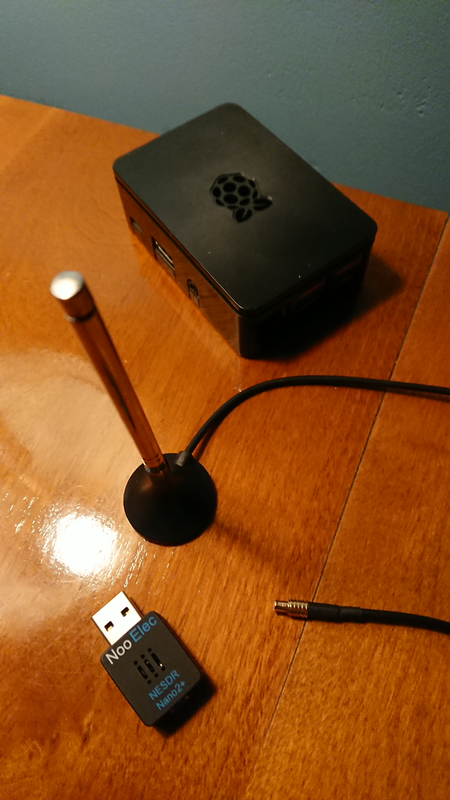 The recipes in this guide use a USB software-defined radio (SDR) plugged in to a raspberry pi, collecting data from Acurite temperature and temperature/humidity sensors. This approach will work with many other types of sensors from other manufacturers, and it will run on other types of computers and operating systems. 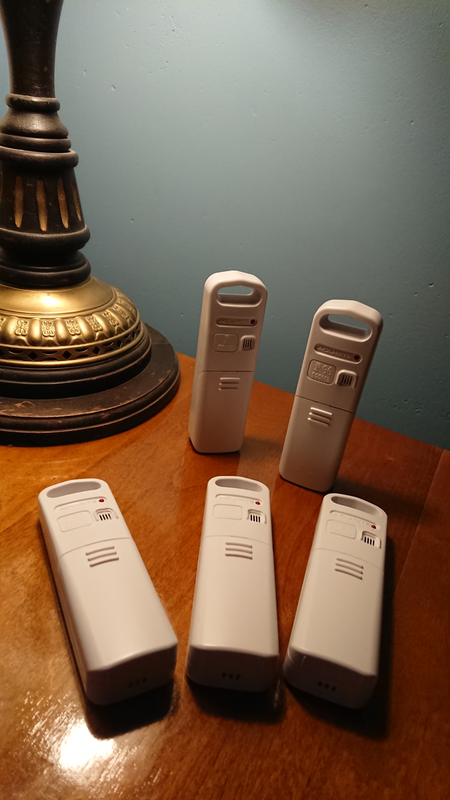 Each sensor uses 2 AA batteries, and the batteries typically last a couple of years under normal temperature ranges. The raspberry pi has a real-time clock and is connected to a home router via ethernet (an old ASUS running tomatoUSB). A network connection is not required to run the system, but it is necessary to download the software. It took me about 2 hours to build this system. That includes the time to remove all of the hardware from its packaging, place the sensors around the house, take the dog for a walk, and take a short break to eat some freshly baked cookies. The prices are US$ as of January 2019. I have seen the temperature sensors on sale at Walmart for as little as $5 each. There are many guides available for bootstrapping a raspberry pi. There are also many guides available for installing and configuring a real-time clock in the raspberry pi. Do it! The rest of this guide requires only command-line access to the pi. So you can do the steps below remotely logged in via ssh, or in a terminal window with a keyboard and monitor plugged in to the pi. When you install weeWX, select Simulator when prompted for the station type. You will change it later to SDR when you run the wee_config --reconfigure command. Now that all the pieces are installed, it is time to tell weeWX which data to collect. This is done by starting at the lowest level, rtl_433, then working up to weewxd. You will first run rtl_433 to verify that it works and to see what signals it picks up. You might be surprised by how many devices in your house (or your neighbors' house!) are sending radio signals that you can detect. Then the next step is to identify which of those signals you care about. Finally, you will create a sensor_map in your weeWX configuration that maps names and values from rtl_433 into the database fields that are used in weeWX. Deploy the sensors one at a time. Put the batteries into the first sensor, then watch it show up in the rtl_433 output. 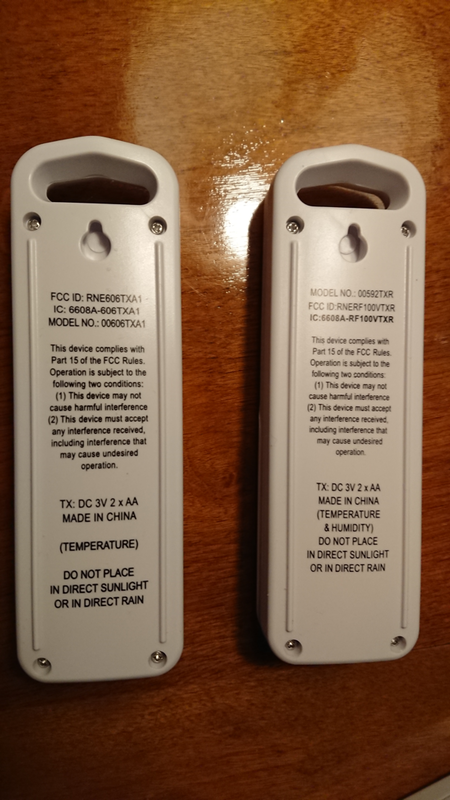 Put a piece of tape on the sensor then label that sensor with the hardware identifier - the hardware identifier is typically called id in the output. Then put batteries in the next sensor, and watch it show up. You will end up with a pile of sensors, each with its hardware identifier clearly marked. Then you can easily keep track of sensors when you map the hardware identifiers to the database fields and the actual sensor locations. Next you should run the weewx-sdr driver directly. This will verify that the driver can capture the output from rtl_433, and it will show you the fully-qualified names for each observation. You will need these to tell weeWX how to capture the data. Notice the --cmd option. If you had to specify other options to rtl_433, be sure to add those to the --cmd option when you invoke sdr.py. sudo PYTHONPATH=/usr/share/weewx python /usr/share/weewx/user/sdr.py --cmd="rtl_433 -M utc -F json -G"
Now you can tell weeWX the full names of the observations from each sensor. In this example, the full names are temperature.0995.AcuriteTowerPacket or humidity.0995.AcuriteTowerPacket. You must tell weeWX how to map those names to the database fields it uses to store the data. This is done in the sensor_map section of the SDR section in the weeWX configuration file. Here is an example showing 4 sensors that I installed. The sensor identifiers are -102, 0995, 16B9, and 0ED5, but of course yours will have other values. The database field names are inTemp, outTemp, outHumidity, etc. You can see the full list of database field names in the archive types section of the weeWX customization guide. First run weeWX directly to ensure that the data collection is working properly, and that data are getting into the database and reports. A minute or two after you start it, you should see LOOP packets that contain the data from the sensors, associated with database field names as defined in your sensor_map. Every 5 minutes you should see an archive RECORD reported. After you have verified it is working properly, kill weewxd. Now you can run it as a daemon so that it will continue to run, even after you log out of the raspberry pi. # run weewx as a daemon and forget about it! In its default configuration, weeWX will put data into a report located at /var/www/html on the raspberry pi. If you have a keyboard and monitor plugged into the pi, you can view the report directly in any web browser on the pi. You can view the report remotely by installing a web server on the pi, such as nginx, lighttpd, or apache. I highly recommend using nginx or lighttpd on the pi, since they use significantly less memory than apache. When you run rtl_433, you might get a warning about a kernel module already being loaded. If so, you can try explicitly unloading the kernel module, then blacklisting it so that it is not accidentally loaded. If you get an error that dvb_usb_rtl28xxu is in use, unplug your SDR device, then try again.